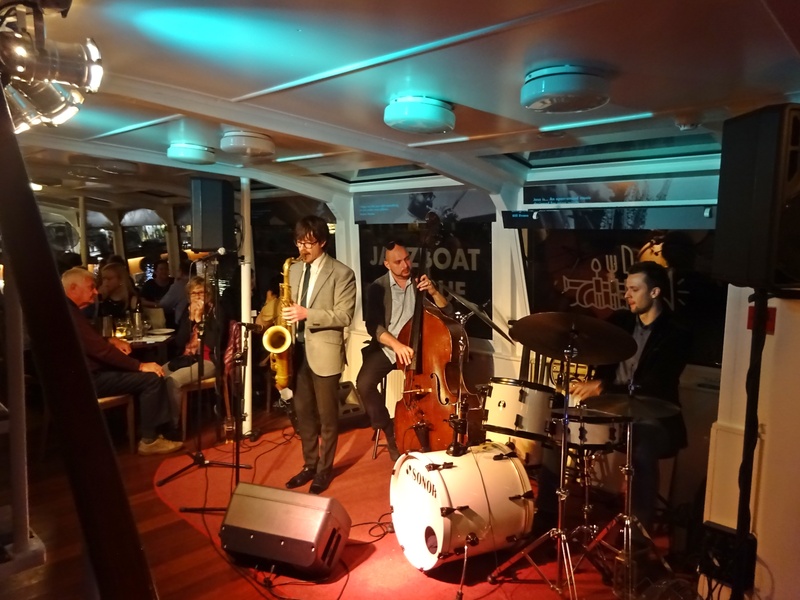 A Prague Jazz Boat Cruise sounded like a touristy evening, but I decided to book it anyway to experience the city by night from the Vltava River. Scenery during the three-hour cruise was magnificent and the company, music, and meal were great. I shared a table with an Israeli couple, Gurami and Shira, who were visiting Prague to celebrate their twelfth wedding anniversary, and a young Swiss flight attendant, Stewart, who was in Prague for the first time. They were fun and we enjoyed talking and sharing travel experiences. The trio – saxophone, drums, and bass – played several sets and were very good. The British sax player provided dry, humorous narrative making everyone laugh. 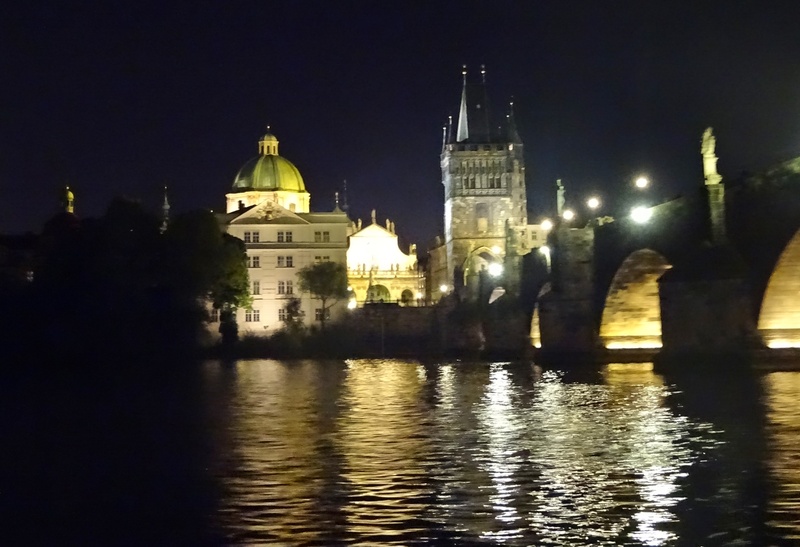 It was incredibly beautiful seeing Prague from the Vltava at night – a shining jewel! This is my last week in Prague. I’ll be leaving May 29th for a several weeks in Rome and have pre-booked a few activities, including a day-long group bike tour around major sites. Not being much of a cyclist, it will be interesting to see how I hold up. The bikes are full-suspension electronic so guess that’s cheating a bit ;o) but I can use a boost! 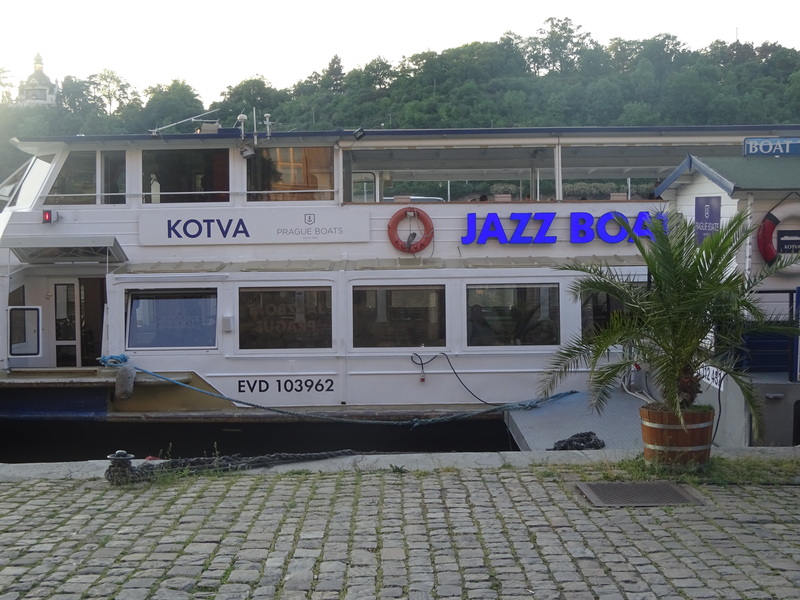 This entry was posted in Czech Republic and tagged Prague, Prague Jazz Boat, Prague Jazz Boat Kotva by suemtravels. Bookmark the permalink. I never learned to ride a bicycle (the measure of a extremely deprived childhood :-) ) and despite several attempts, have never mastered it as an adult. So that cuts me out of a lot of interesting looking tours. I’ll be fascinated to hear how it works in Rome. Happy travelling!